An encouraging case study in the use of a user-friendly home telehealth and patient engagement system comes all the way from Amsterdam. Live Expert® is a remote patient monitoring and video consultation system from ClairVista, a Chicago company with an office, and a large customer, in the Netherlands. Unlike early telehealth systems that were often marketed as a comprehensive solution or as a one-stop-shop for software and peripherals, LE seems to be more of a supermarket. ClairVista has included patient monitoring equipment that provides tracking data used as bases that are used by clinicians for videocalls, in person visits, and educational and other contact with patients. The system works on smartphones and tablets as well as terminals and kiosks. Where LE is different from early systems based on video conferencing technology, it requires no pre-steps to initiating a video session, such as software downloads, account creation, or even the need to know in advance the specific person to contact. To make using the system as easy as possible for elderly patients, LE leverages advanced call management capabilities such as automatic call routing by skill/language/location, active queue management, and live video call transfers. In a recent telephone interview, ClairVista's vice president for telehealth, Doug Irvin, explained the company's concept of simplicity for users. "We believe that the system's simple, one-touch-to-connect design works more like an appliance than complicated technology. Even with the abilities to transmit biometric data, present educational content, and joint video calls with multiple clinicians simultaneously, it is still well suited to all types of patients." Even with a supermarket of features, Irvin insists, LE is not out of the reach of the typical elderly patient, no matter how technologically adept. "Our developers have been told not to dumb down the offering," he told us. "Of course, all organizations prefer simple solutions, but we simplify the experience for patients while providing a feature-rich interface for clinicians. 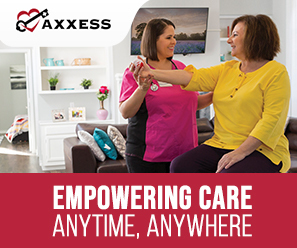 We are focusing our efforts on connecting with healthcare at home organizations that require a powerful but simple-to-use system." One early user is Netherlands-based Stichting Philadelphia Zorg, which cares for about 7500 at-home clients. This company is revolutionizing care for the intellectually disabled/developmentally disabled (ID/DD) population by replacing a number of traditional home visits with video care sessions. With a single click on a website or tablet, patients can (and do) connect with a caregiver whenever they need help. Upshot: Caregivers of these patients report spending more time providing care and less time managing and traveling to appointments. This service model has significantly increased the availability and accessibility of care for Philadelphia's clients while reducing total cost of services. In the past, patients' issues often waited until the next scheduled visit. Now, Philadelphia's caregivers are available on-demand, 24/7, when a immediate intervention or assistance need arises. And, despite a recent 25% reduction in Netherlands government funding to healthcare at home program services (U.S. providers are not alone in this plight), Philadelphia has been able to transform and expand its availability of services. For staff, the remote video-caring concept with Live Expert means a new way of working. As one such clinician notes: "Supporting our patients this way requires a different skill set. It is important to support our patients to live independently. We stimulate achieving this goal in every possible way. With the use of the LE Telehealth solution, helping our patients to achieve independence has become more do-able."